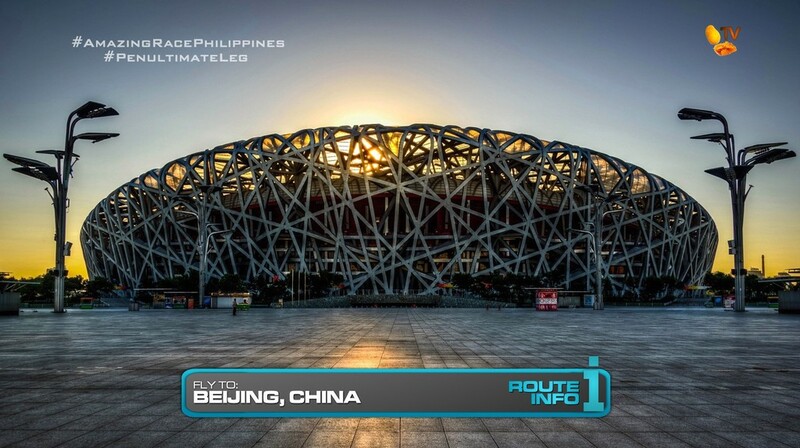 It’s the penultimate Leg of the Race and teams are surprised to learn that they are returning to China! This time, the capital city of Beijing! All teams will be on the same direct Swiss Air flight to Beijing, arriving at 5:15am. 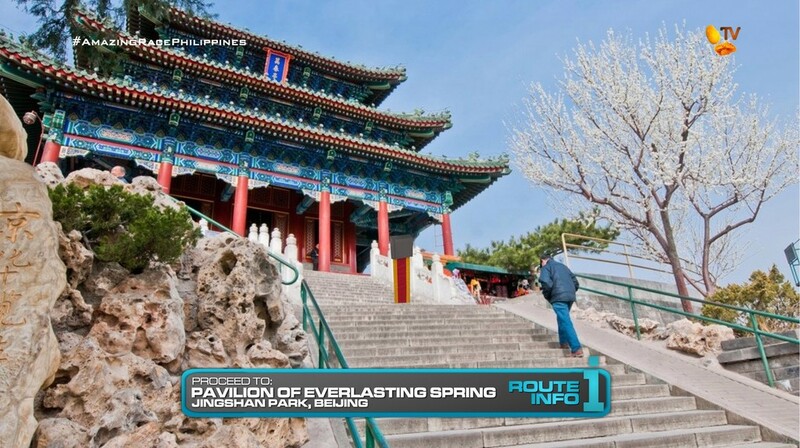 Once in Beijing, teams must find the Pavilion of Everlasting Spring in Jingshan Park. Here, they will find the sunrise Detour: Classical Strings or Slow & Graceful. 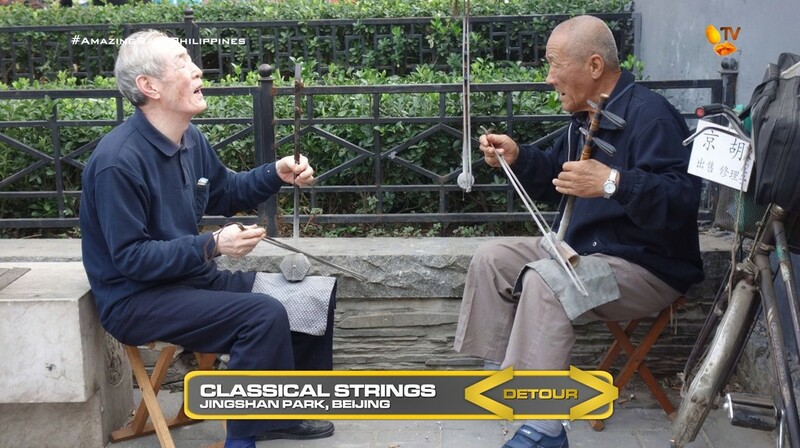 In Classical Strings, teams must learn how to play a traditional two-stringed instrument known as an erhu. After they’ve learned a short piece, they will perform it with a group of locals. If they perform well without mistakes, they will receive their next clue. In Slow & Graceful, teams will join a group of locals in their morning tai chi routine. They must watch and observe the routine and then perform it in order without any help to receive their next clue. 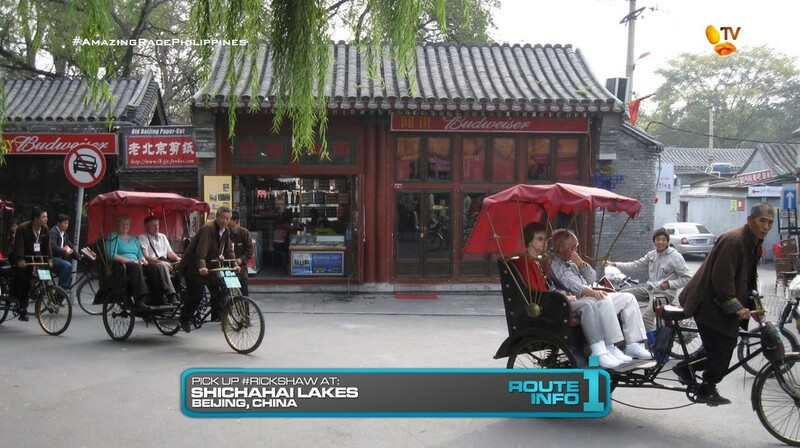 After the Detour, teams head to Shichahai Lakes where they will search for flagged rickshaws. They will take one of those rickshaws and peddle themselves to a noodle shop in a nearby hutong neighborhood. After enjoying a noodle breakfast, teams must return the rickshaw to receive their next clue. 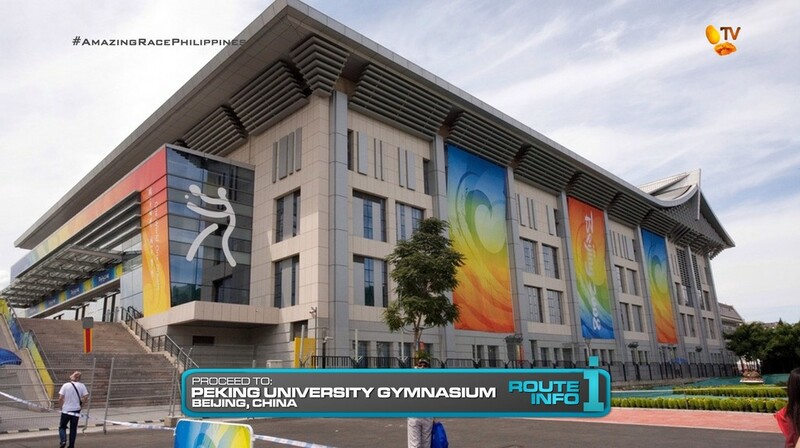 Teams must make their way to Peking University Gymnasium. And here, they will find the Road Block: Who’s ready to get paddled? Peking University Gymnasium hosted the table tennis event during the 2008 Summer Olympic Games. For this Road Block, teams will play a game of table tennis against a 10-year old Chinese National Junior Table Tennis champion and must score 3 points to receive their next clue. After the Road Block, teams will make their way to the North Gate of the Temple of Heaven. 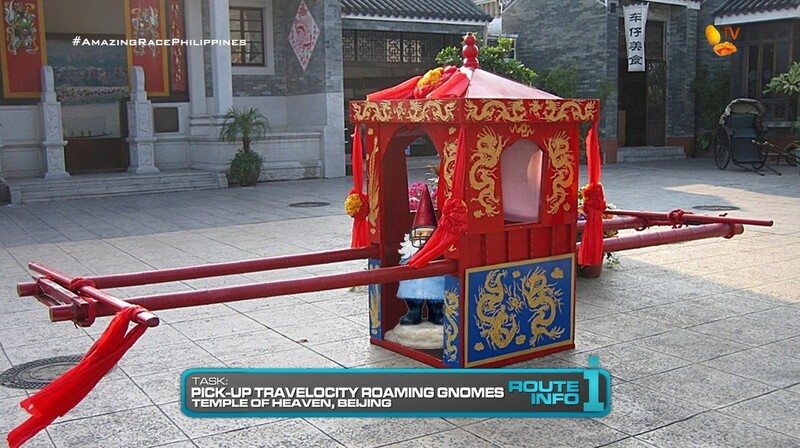 Once all four Roaming Gnomes have hitched a ride in the palanquin, teams must return to the North Gate and place them in chronological order in which they wore the costumes on the Race to receive their next clue. Teams must now find the Wuzhisheng Foot Reflection Health Center. In season 2 of The Amazing Race Philippines, teams experienced an uncomfortable foot massage in Ilocos. But this time, teams will experience a REAL Chinese foot massage. Each team member must receive a continuous 10 minute authentic foot massage, five minutes each, to receive their next clue. If they ask to stop the massage, they will need to start over again. 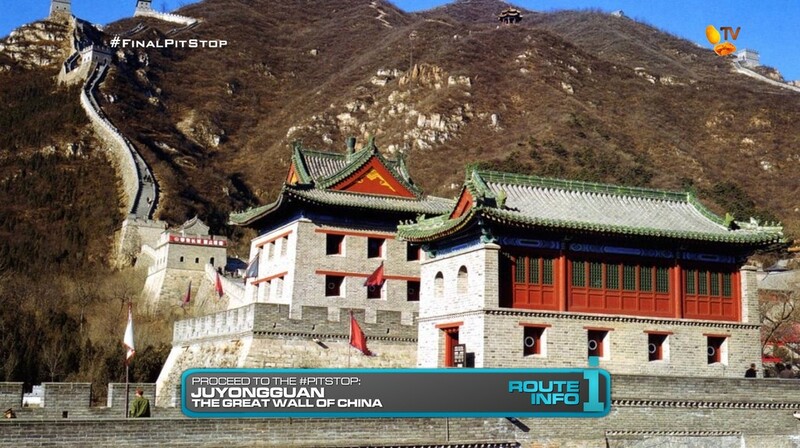 After the relaxing massage, teams can now make their way to the Pit Stop, Juyongguan at the Great Wall of China. But to reach the Mat, both team members must scale the Great Wall! The last team to check-in here WILL NOT be eliminated! There will be four teams running in the Final Leg! And they must now choose a penalty envelope. WILL be eliminated. A very full penultimate Leg! As it should be. I’ve always thought it would be interesting if teams returned to a country they visited earlier in the Race. I don’t know the logistics and immigration challenges (if any) of that, but China is a logical country to visit twice for a TAR Philippines season. It’s an easy (?) country to start and end the Race with. Arriving in the morning, the tasks in the park should be fitting and straightforward. It will also get teams to interact with the locals. 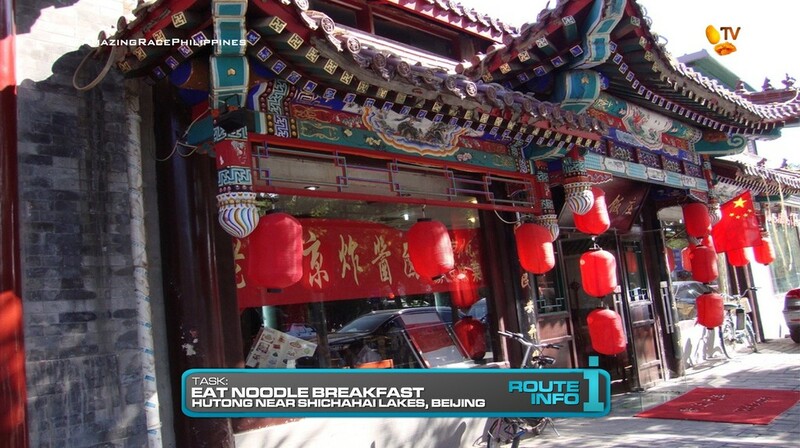 The rickshaw and noodles are basically to get teams into a hutong neighborhood in Beijing. And I didn’t know Beijing had rickshaws. The Road Block is from TAR21 and being in Beijing, there needs to at least be one Olympic-related task. An easy Route Marker to squeeze in would be one at the Bird’s Nest too. Plus, kids are always awesome on TAR. 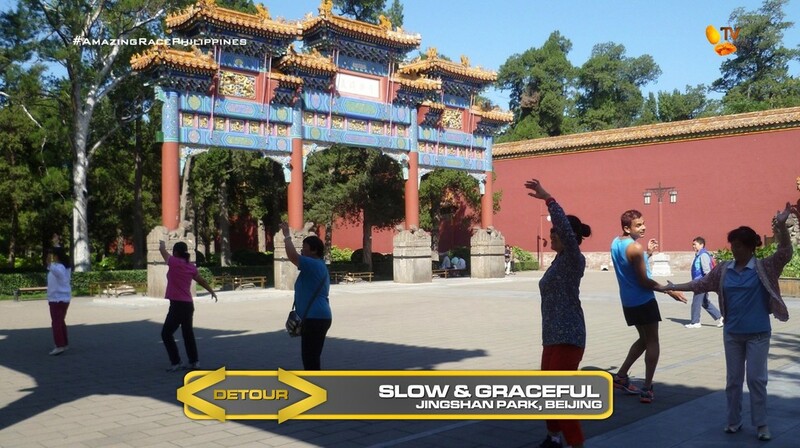 The Temple of Heaven palanquin task brings back the penultimate Leg pseudo-final task that took a season off for TARPHDME5. (Hehe) This should be a highlight of the Leg. The palanquins are definitely not light. And the Temple of Heaven complex is pretty big. So this will definitely be a physical task. The foot massage can easily be omitted. But after TARPH2 (the real one, lol) totally went easy on teams when they recycled the foot massage task, why not have a REAL Chinese foot massage in Beijing, where the original took place. Plus, teams will need it after all the walking in the previous task. It’s also possible to place this before the Temple of Heaven task as well. I’m not sure if that would make the palanquin task harder or easier lol. And finally, a visit to Beijing should definitely include a visit to the Great Wall. Who knows when TARPH will ever visit China again, so you gotta take the chance. Being the penultimate Leg, this scaling the wall to the Mat from TAR10 is a good task to have. It might be cruel to some teams, like the ascender was to TAR5’s Linda & Karen. But you gotta push the teams and not baby them, after all. Originally, I wanted to include the Final Four twist here, but I’m not too sure if it is necessary. ← Recap: Kamen Rider Drive, Episode 44 – Who Had Loved Heart the Most?